Microsoft successfully entered the notebook business last year, debuting the hot Surface Book, with an excellent design and performance to put a MacBook to shame. Now I wouldn’t be surprised if they made their own PC. Till that happens we have a concept of such a device. The creation of Aziz BelKharmoudi, this device is very stylish and aims at being more impressive visually than a Mac. 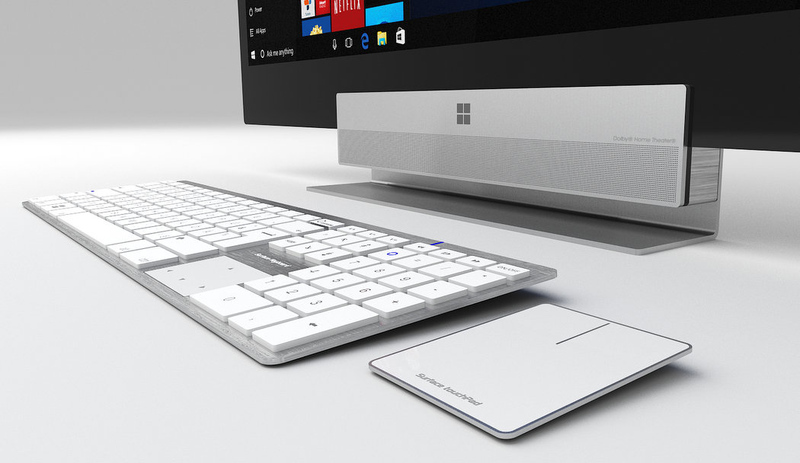 It’s rendered with Windows 10 in mind, a very flat keyboard and mouse, plus an ultra small dock-looking area, that has the display attached to it. The screen is obviously very slim and hidden behind the panel is a series of ports, including a few USBs, audio jacks, Ethernet port and more. I have to say I’m more impressed with the keyboard and Surface “touchpad” than the actual PC, because the angular design may turn off some of the buyers. One of the best aspects about this all in one PC is the huge speaker upfront with Dolby tech and very small speaker holes.